The popular movie on Netflix, “Bird Box” came out on December 13th, 2018, yet people are still talking about it. The movie is full of drama and thrills, leaving you on the edge of your seat at all times. 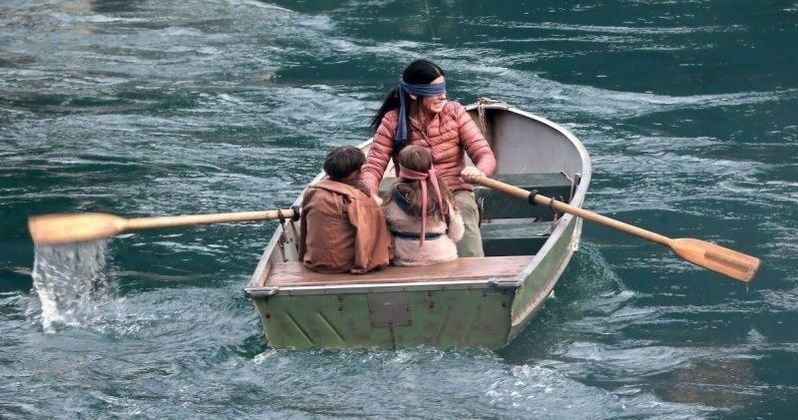 The movie opens with Sandra Bullock and her two children floating down a river blindfolded. The movie then explains some sort of “virus” started to spread throughout the world. If you look at it, you get the urge to kill yourself. The movie continues to go back and forth from past to future, showing how she has stayed alive through the years and helps her kids to be safe. In the end, they get to where they were going and found a safe spot with hundreds of people. I enjoyed the movie very much because there was never a slow part; I was always entertained through the whole movie. My favorite part of the movie was when Sandra Bullock and Trevante Rhodes are running from the people who are trying to get there blindfolds off. Rhodes gives up his own life to save her and her kids. I think that part of the movie was very powerful because when he took off his blindfold he fought the virus long enough to save her. Freshman Tessa Lunog enjoyed the movie because they had to make fast decisions and plan them out carefully. Also, they had to be on there toes all the time in order to survive, and they did all of that blindfolded. One conspiracy theory about Bird Box is the “Creature” or “virus” in the movie is a mental illness. This is because the people who had mental illnesses didn’t kill themselves and wanted other people to see what they feel all the time which would lead them to kill themselves. Another is it’s about becoming a new mother. Bullock didn’t want to name her children and didn’t until the end of the movie. She protects them at all times but is scared of having them with her.